I’m hurtling 150 mph down the straightaway at the Estoril Circuit in Portugal, but you’d never know it from where I sit. 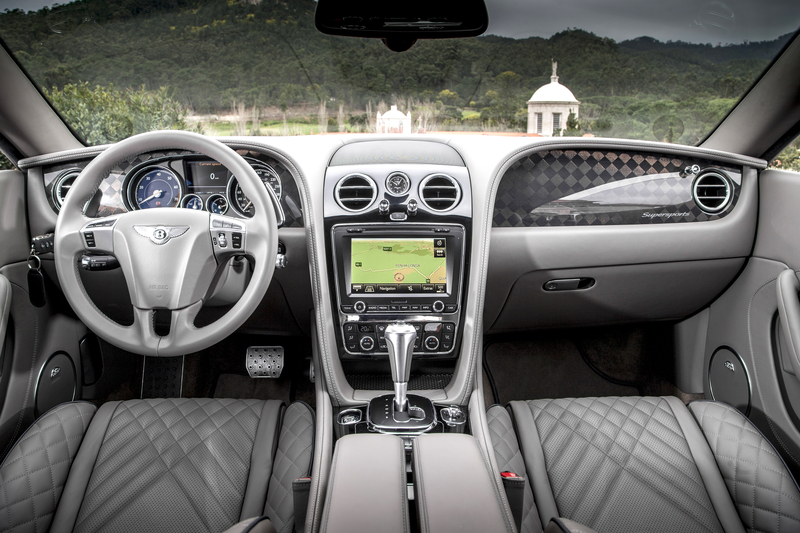 Within the leather and carbon fiber-lined cockpit of the $293,000 Bentley Continental Supersports is a sanctuary from sound and fury, one whose eerie peace is only occasionally interrupted by the pop-pop-pop crackle of the exhaust as unspent gasoline combusts during downshifts. Bentleys are masterful at the art of cruising long distances in supreme comfort, and the latest Continental Supersports is no exception. Case in point: The 189-mile drive to the racetrack involved massaging seats, a delicate but powerful 900 watt 11-speaker sound system, and a vault-like impunity from outside forces like potholes, traffic, and leering locals. But back at the track, the Supersports’ twin-turbo 12-cylinder engine unleashes an ungodly 700 horsepower and 750 lb-ft of torque, enough to jettison it to 60 mph in 3.4 seconds and earn it the title of world’s fastest four-seater. This 209 mph land missile is aided by a torque vectoring system that measures factors like steering angle and vehicle velocity, then strategically applies brakes to individual wheels in order to help the car turn. It’s a seemingly impossible physics cheat on a car that weighs 2.5 tons, but it works: Despite its Sherman tank–like presence, the Supersports negotiates tighter corners that would have left its predecessor in the weeds. In spite of that feeling of effortless forward motion, there’s a lot of engineering going on that helps this Bentley feel like it’s hardly breaking a sweat. Because of the immense cooling needs of that hardworking engine, over 3,800 liters of air are sucked into the radiators at top speed, enough to fill a shipping container in 10 seconds. The larger turbochargers that help produce that power spin at speeds up to 2,500 revolutions per second, with the turbines reaching temperatures as high as 1,800-degrees Fahrenheit. In order to slow down this fast-moving train, the Bentley sports massive 420mm carbon ceramic brakes, the world’s largest in a production vehicle. 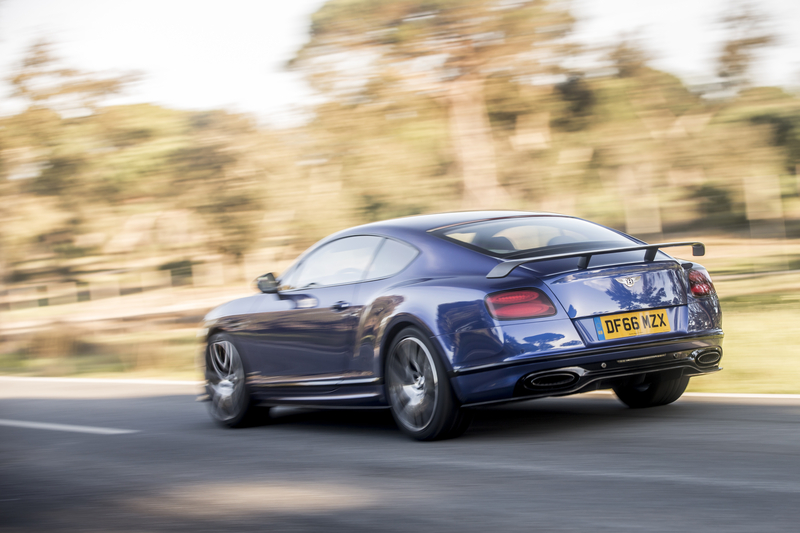 Though it achieves its speed with a delightfully disconcerting level of disregard, the Bentley Continental Supersports is not without its faults. Consider that the multimedia system is woefully out of date, and many of the buttons and switches don’t feel quite up to snuff for a car that costs nearly as much as a house. With the next-gem Continental looming in the wings, it’s only a matter of time before this 13-year-old is updated by an even plusher, sweeter model. But the Bentley Continental Supersports achieves an almost unparalleled blend of quiet comfort and jowl-flattening velocity. There may be other worthy, high-priced 12-cylinder competitors from the likes of Aston Martin, Mercedes-AMG, and Rolls-Royce, but this two-door Flying B presents an alluring case for flying the Bentley flag. Long live the Supersports.